Kick Gas Lawn Care is the First Company in North America to Offer A Robotic Lawn Cutting Service. Yes, You Heard Right… A Robotic Lawn Cutting Service! Picture a robotic vacuum (same concept) but it cuts your grass 24/7. You can have a picture-perfect, manicured lawn every day. No more waiting for your lawn care company to get to you during the rapid spring growth. Why pay for service once a week when you can get service all day, everyday? In order to provide our customers with the best emission-free lawn care in the industry, we need innovative equipment. Last year Kick Gas Lawn Care partnered with Husqvarna, a true leader in battery electric equipment. Whether you are using our regular lawn cutting, or robotic lawn cutting, you can expect the highest quality of service. Here is what you’ve been waiting for! 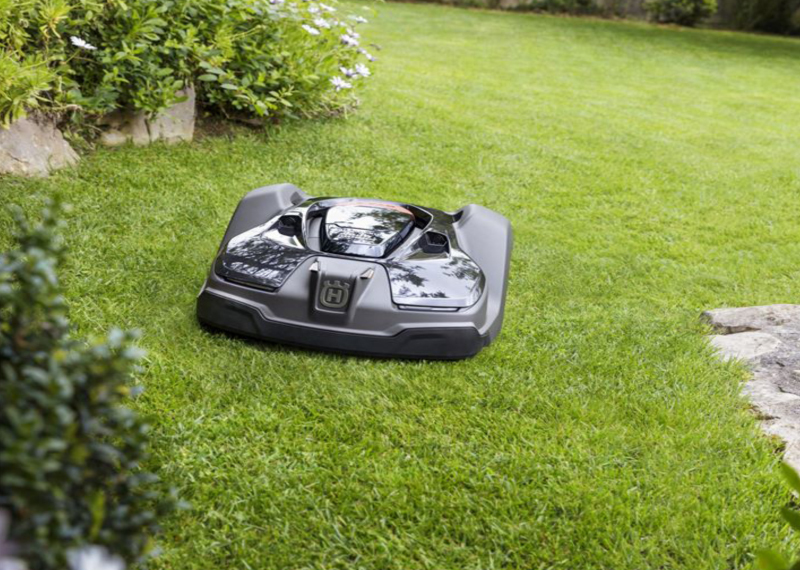 The Husqvarna Automower® is ideal for people with large lawns, or for people who want their lawn looking great all the time. This is a premium service, but it saves you money at the same time. How you ask? Read on! The Automower® cuts the grass into fine clippings that break down rapidly. Weekly cutting creates larger clippings that build up on the surface of the soil. Most insects and fungus thrive in the thatch layer. By eliminating the thatch, you are greatly decreasing the chances of an infestation. Lawn care companies will charge extra for mulching and bagging. No need for bagging with the Automower. Because the clippings are broken down rapidly, they are adding fertilization back into the soil. Now you can fertilize as needed. The Automower® does save money by decreasing the need for other services, but these money saving points are also putting you one step closer to an organic lawn. Non-organic lawn care applications such as herbicides, chemical fertilizers and weed killers destroy the eco-system living within your soil. Healthy soil is teeming with life. Using the Automower® will make your lawn more accepting of organic lawn care treatments to build life within the soil. Now you’re probably wondering how it works. Every property is unique, but the Auto-mower uses advanced GPS mapping to learn your property and become more efficient with each mow. The Automower® may be new to North America, but the technology has been used in Europe for over 20 years. You will be getting a tried and tested machine, built to perfection. Take a look at this video that shows testimonials from around the globe. Take a look at this next video showing how GPS assisted mowing helps the Husqvarna Automower® cut every corner of your garden evenly. Still with us? Those of you that have made it this far will now have the questions like "Will it work in the rain?" or "Is it safe around pets and children?" Since this is a brand new service we can only speculate the questions you may have. So here goes. Q: Will the Automower® work in the rain? A: Yes. It can work in the rain. Your lawn care company may have to reschedule, but not the Automower. Q: Is the Automower® safe around pets and children? A: Yes. The mower is equipped with sensors so that when it runs into an object such as pets, it will reverse itself and chooses another direction to mow. If it does collide with a pet, the contact is very light and unlikely to cause any harm. A built-in safety feature means the blade will automatically stop if the mower is lifted up or turned over. Children should still be made aware that this is a lawn cutting machine and should not be played with. A: Not at all. The sound level of the Automower® is very low, ranging from 69 dB(A) down to 58 dB(A) depending on the model. The average level of normal mowers, generate between 95 and 100 dB(A) of noise. You can easily have the mower working in your yard without disturbing you or your neighbours. Q: What is the maximum operational area for the Automower? A: The Automower® can efficiently cut 54450 sqft (1.25 acres), depending on the model and complexity of your yard. Ideal property layouts can see an increase in cutting performance. Q: Does it have a theft alarm? A: Yes. Automower® has several theft protection systems that may be activated. The mower can not be used without the personal PIN code. The installation lock prevents it from functioning on any other installation other than your own. The time lock requests your four-digit PIN to be entered at an interval decided by yourself. The alarm requires the PIN code to be entered when Automower® is stopped – or an audio alarm will go off. In addition, GPS communication units include a GPS tracker available as an accessory for most models. Q: Will we need to maintain the Automower? A: No. When you sign up for our robotic lawn mowing service we take care of all normal and regular repairs and maintenance. A: No. Installation is included, but this is a prepaid service. Depending on the lawn size, complexity and model needed. Prices may very. Q: Do we need to trim the edges? A: No. We will visit every week to do the trimming, inspect the Automower® and your lawn for potential problems. Everything with be taken care of. Feel free to contact us at anytime if you have any questions that were not covered in the FAQs.